Find a Heating and Cooling expert here. 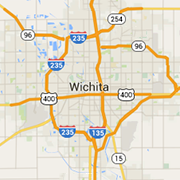 The Wichita area's best HVAC installation, repair and service professionals for residential and commercial projects. Moody Heating and Air Conditioning is your Wichita full service heating and air conditioning professional. Emergency after hours service available. We strive to provide your home and business with professional HVAC installation and repair services. Serving all of Kansas and Oklahoma areas. With over 28 years of experience, Rod's Cooling and Heating is simply the best company there is when it comes to installing and repairing heating and air conditioning units.